Penelope Cruz and Kate Middleton both gave birth to their babies on July 22nd, 2013. 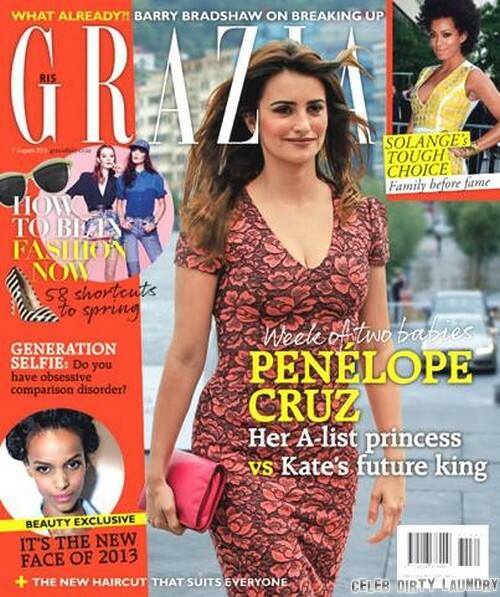 Out of the two famous moms, the new issue of Grazia South Africa looks at who’s better at being a parent, and which of their babies will turn out to be more talented, lovely, and happy. Well, let’s look at their individual parenting skills. I’m immediately inclined to give Penelope more points, simply because she kept her pregnancy so low-key and no one’s even seen her baby yet. Obviously, Kate can’t exactly go against tradition, but it’s unfortunate that she’s obligated to show the world her baby. Then, coming to looks. Again, I’m leaning towards Penelope. I mean, Prince William and Kate are attractive but if William wasn’t a royal, no one would look at them twice. Penelope Cruz and Javier Bardem are internationally famous movie stars for a reason, and their baby is going to be absolutely gorgeous. I’m already half hoping their daughter, Luna Encinas Cruz, meets Prince George when she grows up, and they can start a fairy tale romance. Finally, it comes to talent and happiness. Neither one of these are genetic (my editor disagrees strongly…), so we won’t really know until they grow up. Prince George will definitely be in the spotlight more, but that also lends itself more often to unhappiness than happiness. It’s a lot of pressure for a young boy to be the heir to the royal throne, and while I’m sure he’ll be as protected as he can be, the amount of public attention he’ll grow up with is staggering. I’m hoping the royals make another gentleman’s agreement with the British press, because that’s the only way I see George having a normal childhood. What do you guys think? Do you think Penelope’s daughter or Prince George will be more attractive, happy, and talented? Let us know your thoughts in the comments. Prince George’s Baptism, Christening and Godparent Selection: Kate Middleton and Prince William Rule Out Camilla Parker-Bowles! Camilla Parker-Bowles and Prince Charles Furious At Kate Middleton: Royal Baby Prince George Spending More Time With Middletons Than Royals! Prince William Leaves Kate Middleton and Prince George To Go Back To Work – PR Move or Is Will Bored?